Katoomba is one of the historic towns that's surrounded by the spectacular scenery of the Blue Mountains World Heritage Area. Kedumba or Katta-toon-bah is an Aboriginal term for "shining falling water" or "water tumbling over hill" and takes its name from a waterfall that drops into the Jamison Valley below the Harrys Amphitheatre escarpment. Previously, the site was known as William's Chimney and Collett's Swamp. In 1874 the locality was named The Crushers after the name of the railway station that served a nearby quarry. The name Katoomba was adopted in 1877 and the town achieved municipality status in 1889. The Three Sisters are a rock formation in the Blue Mountains of New South Wales, Australia. They are close to the town of Katoomba and are one of the Blue Mountains' best known sites, towering above the Jamison Valley. Their names are Meehni (922 m), Wimlah (918 m), and Gunnedoo (906 m). The Sisters were formed by erosion. The soft sandstone of the Blue Mountains is easily eroded over time by wind, rain and rivers, causing the cliffs surrounding the Jamison Valley to be slowly broken up. The Aboriginal dream-time legend has it that three sisters, 'Meehni', 'Wimlah' and Gunnedoo' lived in the Jamison Valley as members of the Katoomba tribe. These beautiful young ladies had fallen in love with three brothers from the Nepean tribe, yet tribal law forbade them to marry. The brothers were not happy to accept this law and so decided to use force to capture the three sisters causing a major tribal battle. As the lives of the three sisters were seriously in danger, a witchdoctor from the Katoomba tribe took it upon himself to turn the three sisters into stone to protect them from any harm. While he had intended to reverse the spell when the battle was over, the witchdoctor himself was killed. As only he could reverse the spell to return the ladies to their former beauty, the sisters remain in their magnificent rock formation as a reminder of this battle for generations to come. This legend is claimed to be an Indigenous Australian Dreamtime legend. Alternative legend says that three sisters, Meenhi, Wimlah and Gunnedoo had a father who was a witch doctor. His name was Tyawan. Long ago there was a Bunyip who lived in a deep hole who was feared by all. Passing the hole was considered very dangerous, therefore whenever Tyawan had to pass the hole in search for food, he would leave his daughters safely on the cliff behind a rocky wall. One fateful day, Tyawan waved goodbye to his daughters and descended down the cliff steps into the valley. Meanwhile at the top of the cliff, Meenhi was frightened by a large centipede which suddenly appeared before her. Meenhi took a stone and threw it at the centipede. 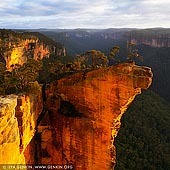 The stone continued on its journey and rolled over the cliff, crashing into the valley below which angered the Bunyip. The rocky wall behind Meenhi, Wimlah and Gunnedoo then began to split open and the three sisters were left stranded on a thin ledge at the top of the cliff. All the birds, animals and fairies stopped still as the Bunyip emerged to see the terrified girls. As the Bunyip began to approach the girls, to protect them from harm, their father Tyawan used his magic bone to turn them into stone. Angered by this, the Bunyip then began to chase Tyawan. Becoming trapped, in order to flee from the Bunyip, Tyawan changed into a magnificent Lyre Bird, yet in the process dropped his magic bone. Tyawan and his three daughters were now safe from the Bunyip. Once the Bunyip had disappeared, Tyawan returned in search of his magic bone, yet this was never to be found. The Lyre Bird has been searching for this magic bone ever since. Remaining in rock formation, The Three Sisters stand silently overlooking the valley hoping that one day he'll find the bone and turn them back to former selves. When visiting The Three Sisters, if you listen carefully you may be able to hear the Lyre Bird, Tyawan, as he continues his quest for his lost magic bone. However, Dr Martin Thomas, in his work "The artificial horizon: imagining the Blue Mountains", clearly shows that the "aboriginal" legend is a fabrication created by a non-Aboriginal Katoomba local, Mel Ward, presumably to add interest to a local landmark. The story originated in the late 1920s or early 1930s and is unknown prior to that date. 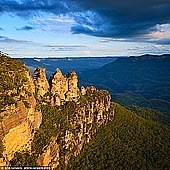 The Grose Valley, in the centre of the Blue Mountains National Park in New South Wales, Australia, is regarded as the cradle of conservation in NSW. At the heart of the Grose lies the magnificent Blue Gum Forest, the site of which was the first major conservation battle in the state in 1931. Since then, almost the entire catchment has been reserved in the National Park. The main reason that the valley was able to escape development is the massive cliffs on either side. There are only a handful of easy passes into or out of the valley, and development has been limited to the cliff tops. Much of the valley has recently been preserved as wilderness, further protection for the chasms, canyons and cliffs that make up this spectacular landscape. Charles Darwin described the Grose Valley as 'stupendous ... magnificent' when he visited this place in 1836. Blue Mountains and Grose Valley with Govett's Leap lookout (the second most popular lookout in Blue Mountains) are only two hours by train from Sydney. They are still magnificent, with majestic gorges, tumbling waterfalls and its distinctive hazy blueness. The Govett's Leap lookout is named after the first white man to have come to the spot, William Romaine Govett, as an assistant surveyor in June 1831, who discovered the leaping waterfalls there, that drop vertically over the side of the deep gorge down in to the sub-tropical bush below. Hanging Rock is a outstanding sandstone cliffs near Baltzer Lookout, at the end of Ridgewell Road, Blackheath, Blue Mountains, NSW, Australia. A huge, overhanging block of sandstone over 100m high, jutting out into the Grose Valley, has become detached from the main cliff. It has featured in many calendars and climbing photos, and was also the site of the main climbing scene in "The Edge" movie. How to get there: Drive west along the Great Western Highway, turn right on to Ridgewell Rd, 800m after the main traffic lights in Blackheath. The right turn is not really noticeable. Follow the dirt road for approximately 2.5km until you reach a locked gate. Park here. Then you need to walk for 3.5km along the fire trail to the Baltzer Lookout. Usually it takes 40 - 45 minutes. The track is mainly management trail, and would be great on a mountain bike (to the end of the management trail). The walk to The Baltzer Lookout rewards you with excellent scenery and spectacular views up and down the Grose Valley. The lookout is named after W.J. Baltzer, who was part of a group created by Myles J Dunphy to recommended that the Grose Valley become a wildlife sanctuary, in 1933. The Hanging Rock will be at your left and a little bit below the lookout. The large cliff edges are unfenced and quite exposed, so do take care. Although short and relatively unchanging in scenery, the walk to Baltzer Lookout is well worth it. From the Baltzer Lookout you need to follow a steep track down to the left which leads to even better views of Hanging Rock. Please be very careful as the track goes right at the edge of the cliffs. The cliff is very popular with rock climbers and abseilers and there is an anchor point for attaching a rope. It's quite often you can see people abseil from the tip of this rock, down deep into the Grose Valley below. Walkers can enjoy amazing view of the Hanging Rock from the Baltzer Lookout. If you are fearless, you can even walt over the slip to the Hanging Rock itself. The gap between the rock and the cliff is only about 80cm, however, be very careful and do so at your own risk - a slip could prove fatal. The best time for photographing the Hanging Rock is early in the morning as reflected morning light casts a nice warm glow on the Hanging Rock. In summer you need to start walking in the middle of the night because of early sunrises.